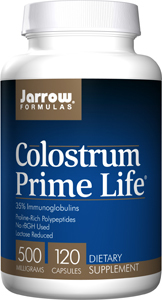 Jarrow Formulas Colostrum Prime Life contains a minimum of 35% immunoglobulins, double the strength of typical colostrum products, because it comes from the first milking. Colostrum Prime Life is collected within 12 hours of calving from American, pasture-fed cows. The colostrum undergoes low-temperature processing along with testing to ensure that the difference colostrum immunoglobulin fractions retain their biological activity and are not denatured. Colostrum Prime Life also contains proline-rich polypeptides (PRPs), a special class of polypeptides shown to have immune modulation and gastrointestinal health-promoting properties. Colostrum Prime Life is also rich in lactoferrin, an important iron building glycoprotein found naturally in tears and saliva that supports immune function and promotes the growth of the good bacteria. Colostrum supplementation is shown to increase levels of Insulin-like Growth Factors (IGF) in the body which can replace insulin function in diabetics (type 1 and 2) and non diabetics. Increased IGF levels also increase Growth Hormone (GH) levels which aids in anabolic activity, promotes healing and slows down aging in general. Colostrum prime Life is free of hormone rBGH, antibiotics pesticides, and is F.D.A certified for sale in the USA. Please click the following link for information: Oral administration of insulin-like growth factor-I from colostral whey reduces blood glucose in streptozotocin induced diabetic mice.